Pohnpei—In this morning’s pre-dawn hours dozens of people gathered together at the Kangaroo Court, the Royal Australian Navy housing complex, to commemorate ANZAC Day. The 25th of April, ANZAC Day, is one of Australia's and New Zealand’s most important national commemorative events marking the anniversary of the first major military action involving Australian and New Zealand forces during the First World War. Around the world and in every city and town in Australia and New Zealand, commemoration services are held at dawn, the time of the original landing by the ANZAC’s on the beaches of Gallipoli, Turkey in 1915. It is a day when all Australians and New Zealanders reflect on the sacrifices of so many. Lt. Commander Lauren Milburn of the Royal Australian Navy gave the welcome and call to commemoration. 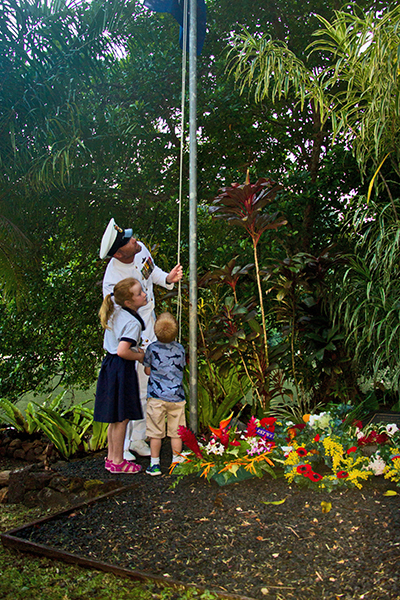 It was the Lt. Commander’s first Anzac day commemoration in Pohnpei which proceeds universally along a prescribed course no matter where it is commemorated, though the subtleties do vary. The celebrants were asked to join in the singing of the hymn, “Abide With Me”. Chief Petty Officer Byron Evans read the poem, “Waiting” written by poet Lee O’Neill. Australian Embassy’s Charge’ d’Affaires Eliza Woolcock provided the official address. Australia’s Charge d’Affaires, Eliza Woolcock spoke next. “Australians and New Zealanders had fought in battle before April 1915 but as part of another nation’s forces. We commemorate this as ANZAC Day because it is the anniversary of the first time they fought under the flags of their own countries,” she said. “Today the first rays of sunlight on the dawn of the 25th of April 2018 in Pohnpei will soon shine for the hundreds of thousands, if not millions, who will be at other dawn services this morning around the world. “We do not glorify war, but we are grateful for the willingness of service men and women to put their lives at risk for the good of others; to work together to protect values, and people, not only of their time, but also for future generations unknown to them,” she said. After her speech, representatives of several nations and organizations participated in the laying of wreaths at the ANZAC shrine. The Last Post bugle call was sounded followed by a minute of silence in remembrance. Reveille was sounded while flag bearers, Maisy and Amos Milburn and Emily and Jameson Evans helped their parents to raise the Australian and New Zealand flags. 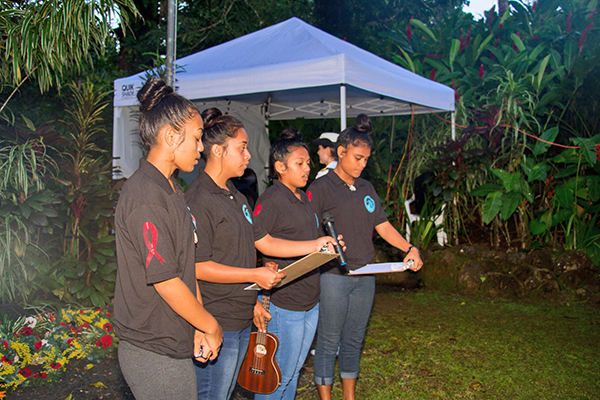 The Youth 4 Change choir sang the Australian and New Zealand National Anthems. After the solemn ceremony, a traditional, hearty “Gun Fire Breakfast” was served on the compound.